The cost of a Thanksgiving Dinner is declining. From New York’s Macy’s Day Parade, to huge dinners with all the trimmings and early Black Friday sales, the modern version of the Thanksgiving holiday in the US is an exercise in consumer spending power. 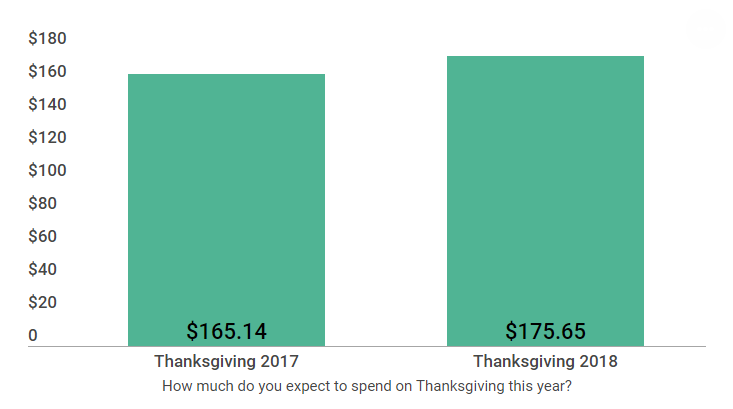 Below are six charts giving an insight into the levels of spending across the 12-day Thanksgiving holiday period. The average cost of a Thanksgiving dinner is the cheapest it has been since 2010. According to the American Farm Bureau Federation, the average cost of a dinner for 10 is $48.90 this year, less than $5.00 per person. This is a 22-cent decrease from last year’s average of $49.12. These falls were driven by the most expensive item on the Thanksgiving table - the turkey - these have dropped in price by an average of 3%. Foods showing the largest decreases this year in addition to turkey were milk, sweet potatoes, green peas and bread rolls. You might think that all the extra demand for turkeys at Thanksgiving would push their price up at this time of year, but in fact the opposite happens. 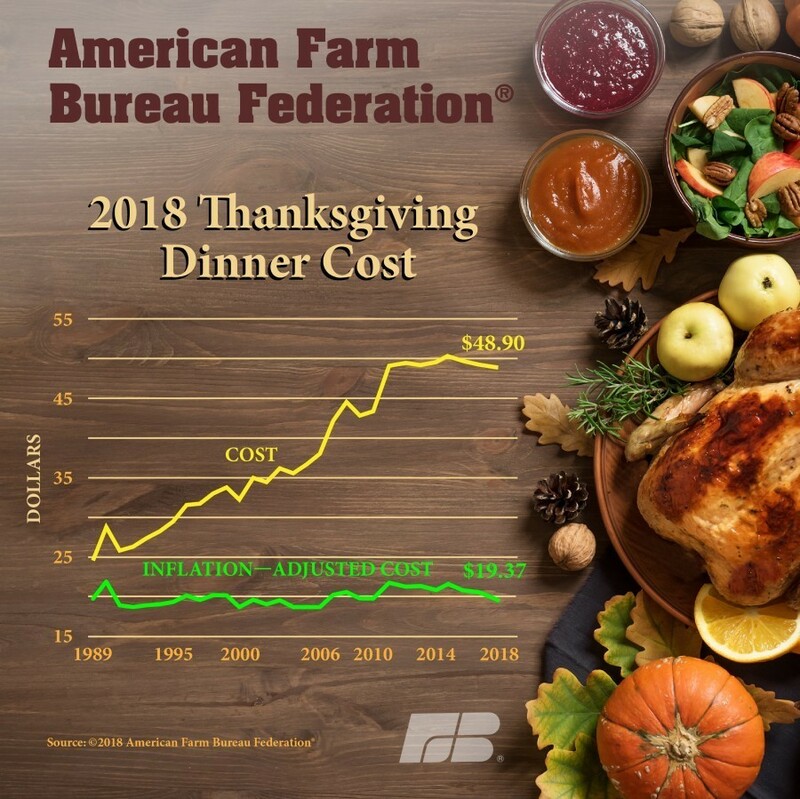 With an agricultural industry geared up to breed, rear and slaughter the majority of its turkey stock in time for Thanksgiving, the above graph shows how the average price per pound (450g) of fresh turkey plunges in November to an average of $1.25. The blue line represents the average price of turkey during each month between 2000 and 2017, while the other lines represent each individual year. The downward price trend continues from November into December, making turkey even more affordable for the Christmas dinner table. While turkeys will be cheaper overall for this year’s Thanksgiving, there are wide variations in prices across the US. 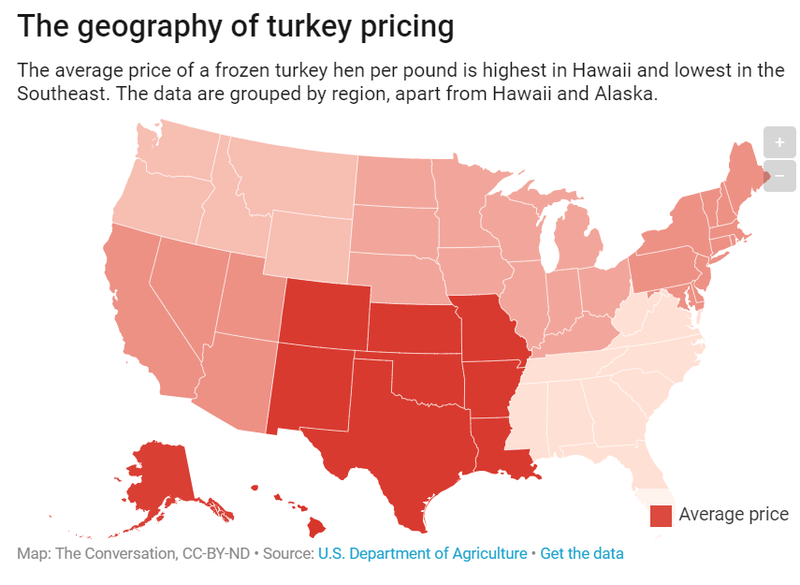 Although frozen turkeys are most expensive in Hawaii at $1.13, the variations in price cannot be explained by shipping costs alone: Arkansas is among the states with the highest average price, even though it raises roughly one out of every 10 turkeys eaten in the US. The more likely reason is competition between stores selling turkeys. The lowest prices are found in the US’ southeastern states, where there are more stores selling turkeys than in other parts of the country: data from the US Department of Agriculture shows that it tracks turkey prices in 7,400 supermarkets in the Southeast, but it is able to track prices in just 4,900 stores in the South Central part of the country. If you are flying for Thanksgiving from a southeastern state like Florida where the average price per pound in just $0.72 to a state like Hawaii, it could make sense to pop a frozen bird in your luggage. 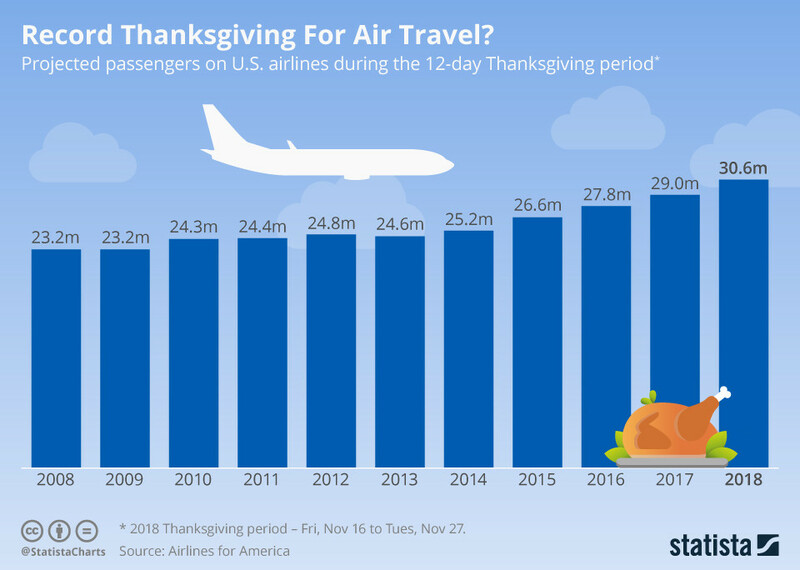 There will be more than 30 million passengers taking to the skies in the US over this year’s Thanksgiving period, according to Airlines for America. This is a record number, and an increase of 5.7% on 2017, with more than 2.5 million people on average flying over the 12-day period. This is more than 137,000 extra passengers every day compared to last year’s Thanksgiving. The top two busiest days for flights are expected to be Sunday 25 and Wednesday 21 November. No national holiday would be complete, it seems, without an accompanying retail extravaganza - and Thanksgiving is no different. Thanksgiving always falls on the fourth Thursday in November, and the following day - dubbed "Black Friday" - is one of the biggest discount shopping days of the year. The following Monday is even bigger. And as the popularity of Black Friday quickly spread throughout the US, it seemed inevitable that some retailers would open their doors on Thanksgiving itself. Now, many stores in the US stay open on "Turkey Day", with prices already slashed ahead of the annual Black Friday-Cyber Monday sales bonanza. Not everyone thinks this is a good idea, as the above chart shows, and some stores make a point of staying closed to make sure employees enjoy some quality time with their families. In 2017, according to Adobe, $2.9 billion was spent on Thanksgiving itself, with Black Friday bringing in $5 billion. Cyber Monday was the real star of the show, bringing in $6.6 billion in online sales in the US alone. This year, it's likely to be even bigger. While the cost of a Thanksgiving dinner may be falling, the overall cost of the holiday is increasing. A survey by credit firm Lendedu found that the average American is spending $175.65 per person on Thanksgiving, up from $165.14 per person in 2017. The big driver for this increase is travel costs, with those surveyed saying that on average more than a fifth of their Thanksgiving expenditure will go on travel. Last year over 50 million Americans journeyed at least 50 miles from their home for Thanksgiving.